October is the Breast Cancer Month, which attracts special attention worldwide. In the UK this special attention is paid to women who are confronted with breast cancer. And there are many. There are currently more than 71,000 women every year. It's very drastic when it hits you. A very uncertain time begins with the message ‘something has been seen, we have to continue investigating’. They hope and think that it won’t be very serious, but there is more to it. Further investigations follow, uncertainty follows, perhaps surgeries and treatments. The hard part is that you don’t know what to expect, the future is uncertain and you don’t know how to respond to the treatments. And that's a very difficult time. Especially for the one who comes across and has to undergo it. But also for the personal environment. And that's why it's important to pay attention to these women. It can happen to any woman. This is what Pink Ribbon does during this Breast Cancer Month. Projects and research in the areas of treatment, follow-up and long-term consequences of breast cancer. The goal is a better and longer life for the (ex-) breast cancer patients. And the importance of these actions is clear, because just because it affects so many women, a lot of money is needed. Names4ever supports Pink Ribbon. With the sale of our Pink Ribbon jewelry, 33% of the amount goes to the Pink Ribbon Foundation. 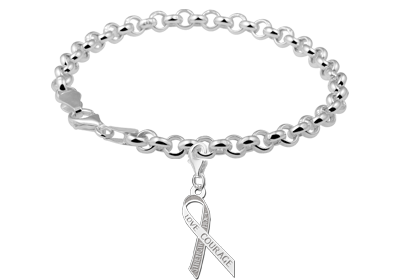 The special feature of our Pink Ribbon jewelry is that you can also engrave a personal message in the jewelry. For example, consider a name or date, but also a meaningful word that shows you want to give a heart to breast cancer patients. A word like "hope", "love" or "strength" gets a much deeper meaning when it comes to breast cancer. The Pink Ribbon jewelry is made in the form of the Pink Ribbon logo. They are available in 925 sterling silver and 14 karat gold. 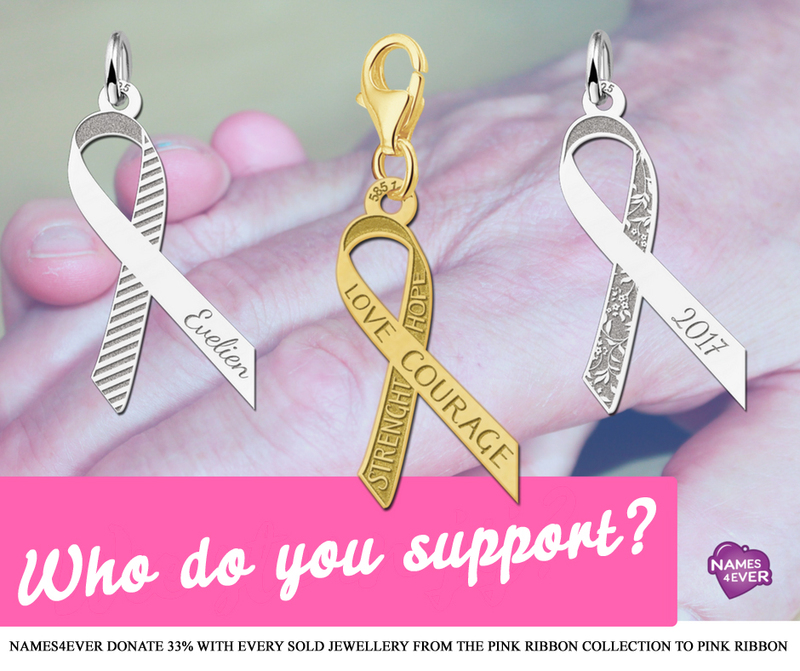 You can choose between a Pink Ribbon Pendant or a Pink Ribbon Bracelet. You can order the wristlet and pendant separately, so that you can hang it on your own necklace or bracelet, but we also supply matching jewelry. 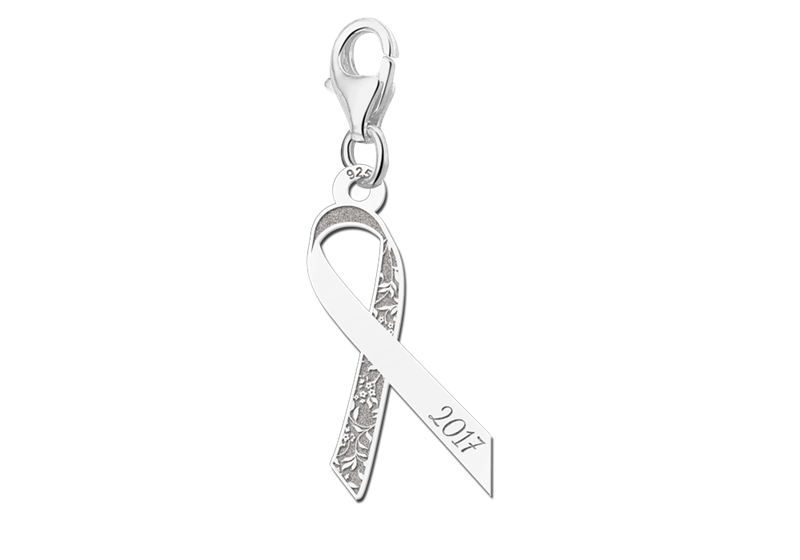 We have pendants in the form of flower-engraved ribbons on the back of the ribbon or with stripes. Personally, we find the pendant with the words "Strength" and "Hope" engraved on the back very beautiful. You can also engrave a personal text, a name or a date on the front part. That's what you wish for someone with breast cancer, although sometimes it's difficult to find the right words. Take a look at our collection of Pink Ribbon Jewelry . It is a nice gesture to show that you want to support breast cancer patients while you simultaneously support Pink Ribbon. If you have a special request, we would like to discuss the possibilities with you.